6 X-Mas Skelly Cards in a Box, available at The Starving Artist in November and also in my shop. 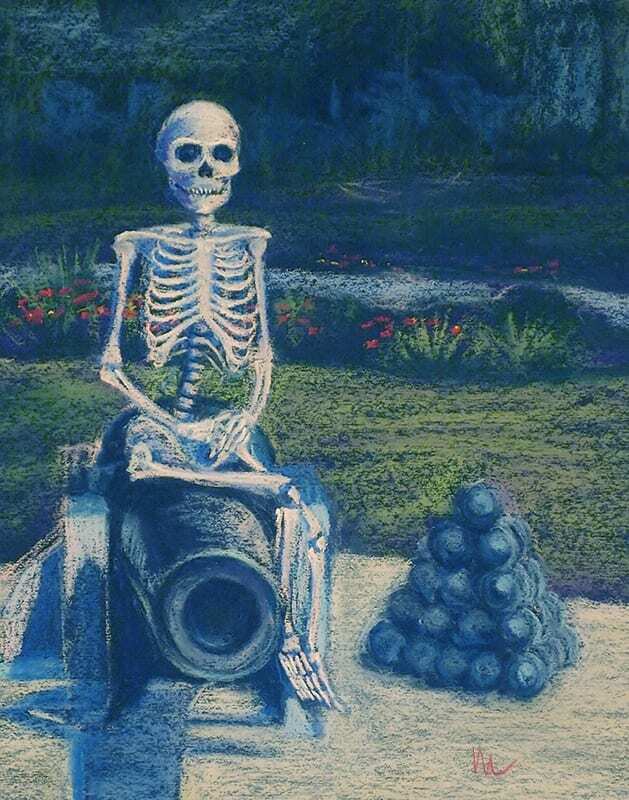 Skelly X-Mas cards will be at The Starving Artist for November 2015. 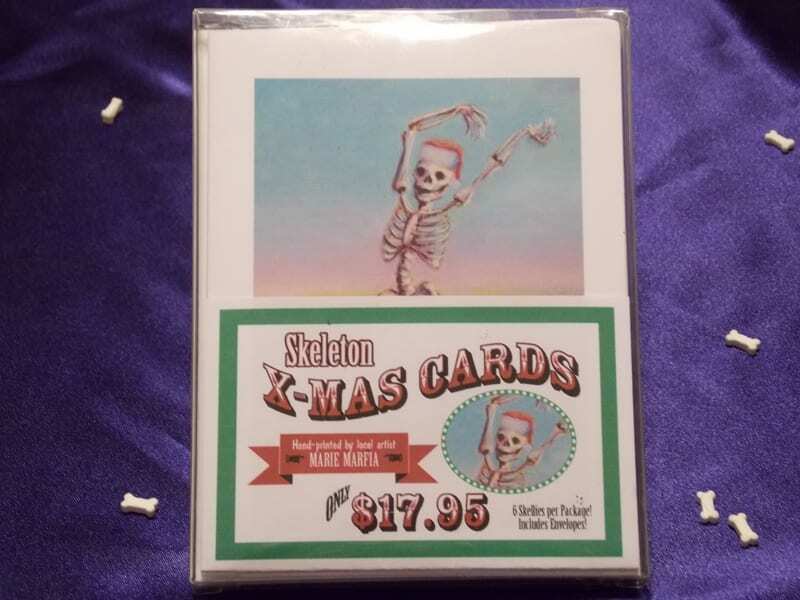 They feature six different dancing skellies in santa hats per box for $17.95. The cards are 4.25 x 5.5″ when folded, are blank inside and come with envelopes. 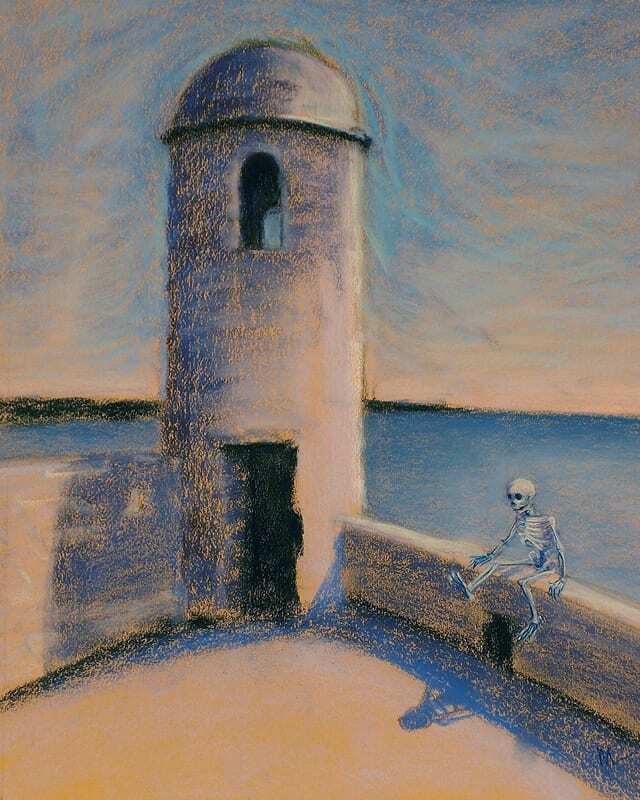 Also available in my shop, if you can’t get to St. Augustine to the gallery. 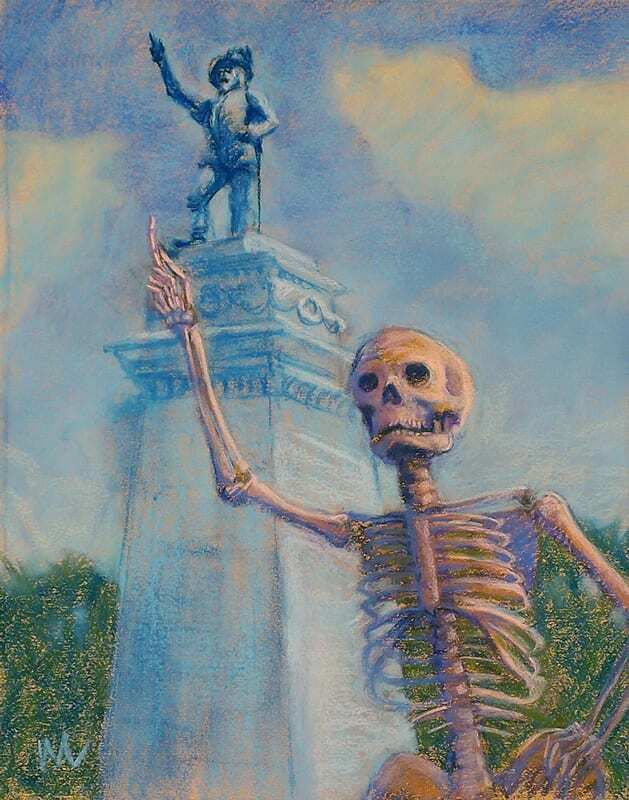 Perfect for the Day of the Dead fans on your list! 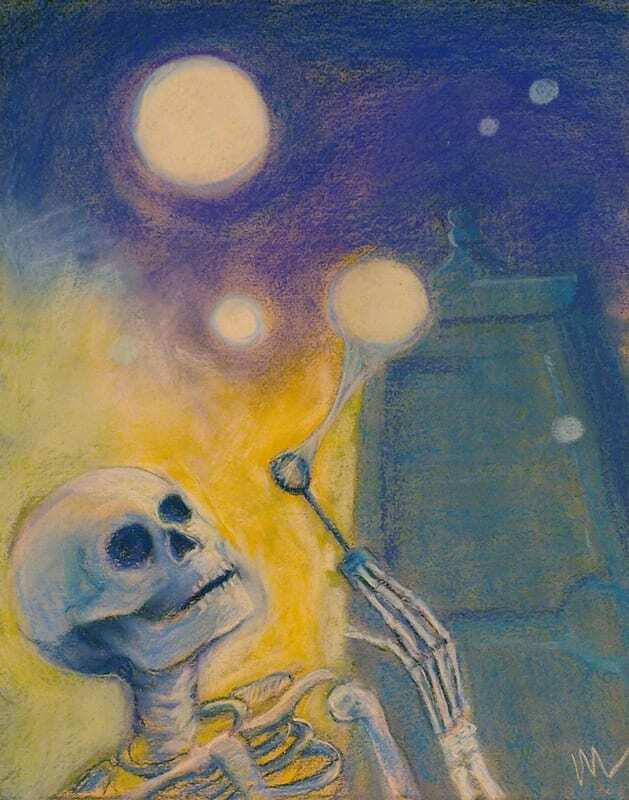 Original pastel art at The Starving Artist in November includes “Dance at Bougival” for $670, and “Orbs” for $300. I’m working on designing prints and cards based on “Dance at Bougival”, and hope to offer them soon. 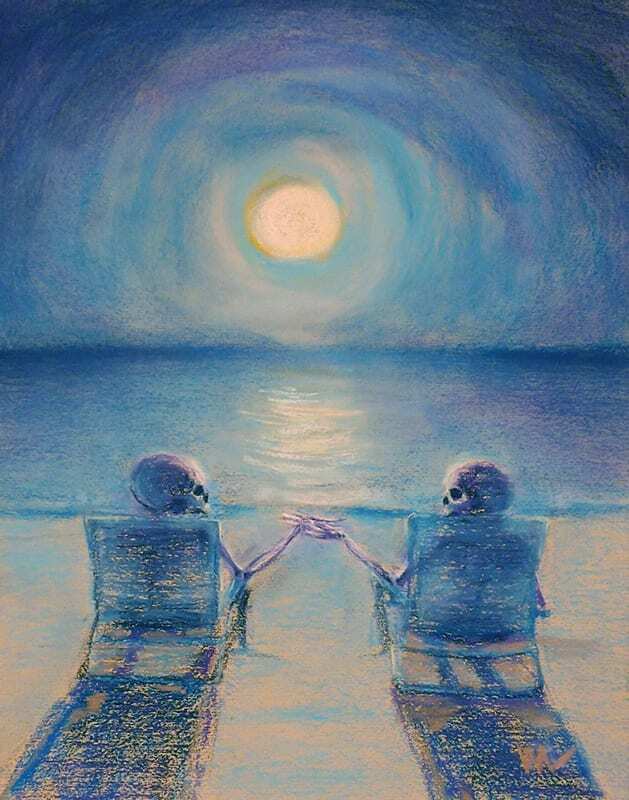 Meantime, since the holidays are for lovers, I am including “Shall We Dance”, “Happily Ever After,” and “Pull My Finger” in 11×14″ size and as 5×7″ cards. The 11×14″ prints are $34.95 and the 5×7″ cards are $4.95 each or 3 for $12.95 or 6 for $18.95. 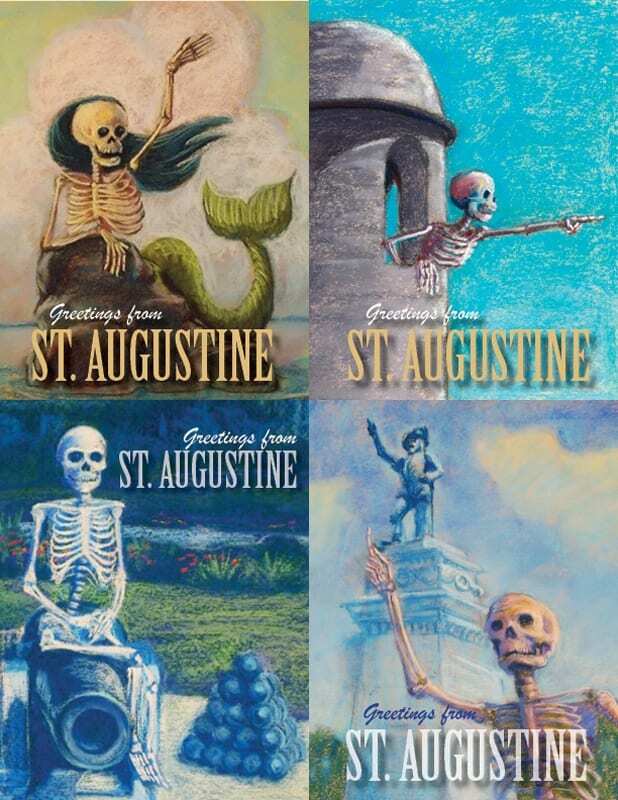 As always, there is a good selection of “Greetings from St. Augustine” postcards at the gallery, too. Postcards are $1.95 each or 3 for $4.95. 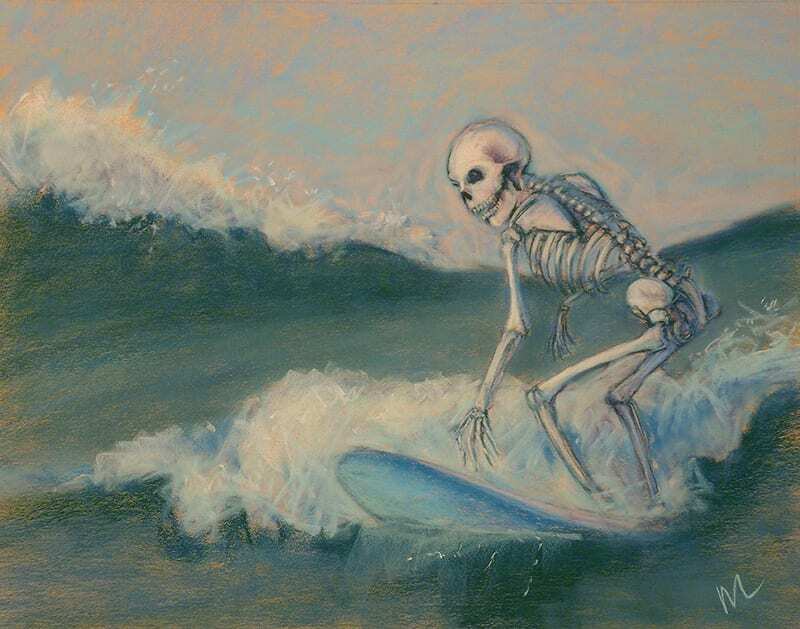 If you’re out and about in St. Aug for November, be sure and stop by to get your skelly fix! Have you signed up for my weekly newsletter Bone Appetit? It’s a compilation of the best of my blog plus insights into my creative process and it’s delivered right to your inbox every week! Just fill in your email address on the right. Bonus, you’ll receive a printable note card featuring my mermaid skelly Hello Sailor just for signing up! See to it! 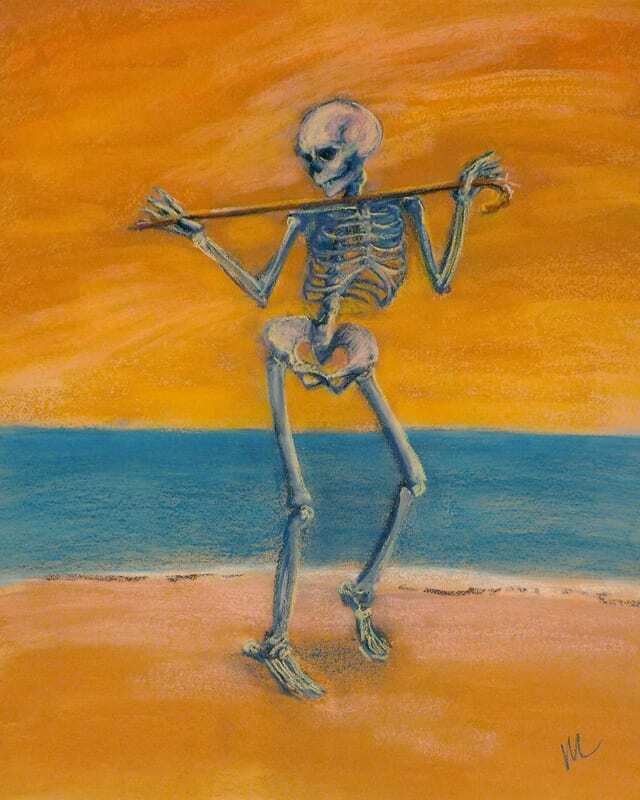 This entry was posted in art business, Skelly dancer and tagged cards, christmas, Marie Marfia, November, original, originals, prints, The Starving Artist, x-mas on November 5, 2015 by Marie Marfia. Here are my 5×7″ prints, double-matted to fit perfectly into 8×10″ frames. Sweet! I’ve got twelve different double matted prints all wrapped up and ready to go for October’s show at The Red Sable. These will be for sale, $12 each or 3 for $30. Now I’m on to note cards. I figured to put 2 each of 2 different designs into each package and charge $8 or 3 packages/$20. The question is, which ones should I combine with which? Wonder if We’ll See Anyone We Know? Should I put two dancers together? 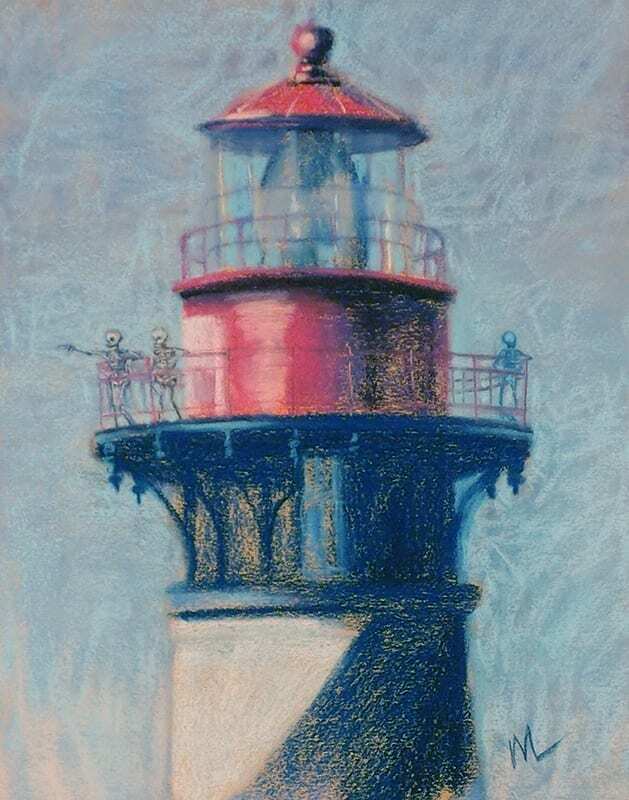 The mermaid and the lighthouse? 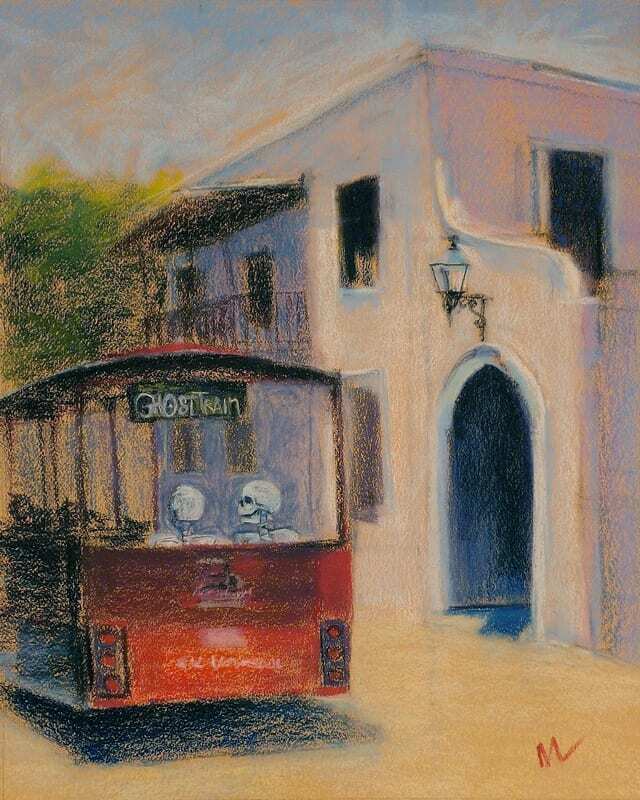 Pull my finger and the couple in the Ghost Trolley? Which ones would you like to see paired together? Or should I just make all four cards in the package the same? Let me know in the comments! 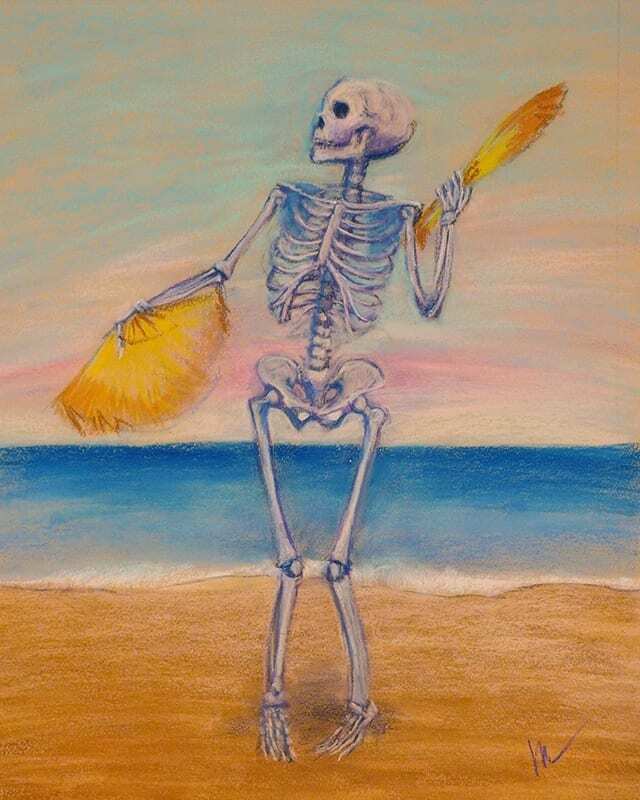 This entry was posted in A pastel a day, art business, Skeleton, skeletons, Skelly dancer and tagged art show, cards, prints, The Red Sable on September 23, 2015 by Marie Marfia.